One evening, enjoying a big plate of spaghetti and meatballs, I marvelled at the size of the awesome Trader Joe's Italian style meatballs. They are huge! Four is my personal single-plate limit. Our little family has trouble finishing an entire pack in one sitting, so I usually end up with a spaghetti lunch the next day. 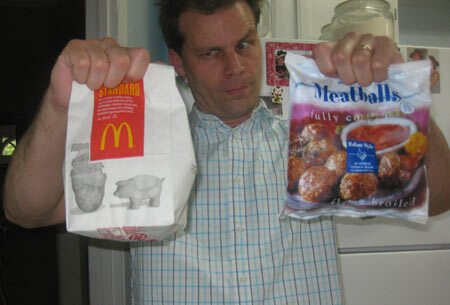 At lunch, I got to thinking about the cheeseburger testing I had done in January and wondered, how would these Trader Joe's meatballs compare to the meat patty of a McDonalds cheeseburger? It took a while, but eventually these two lunchtime favorites came face to face for a direct comparison. 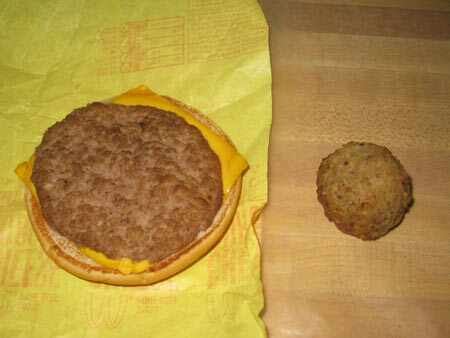 I had previously heard that McDonalds has two basic patty sizes, the quarter-pounder and the tenth-pounder. 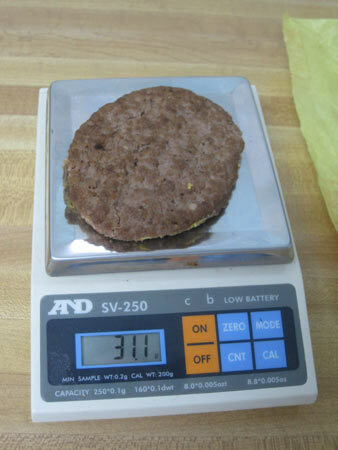 Regular McDonald burgers and Big Macs use the slimmer tenth-pound (1.6 ounces) patties. However, that is their weight before cooking. After cooking, they weigh less. 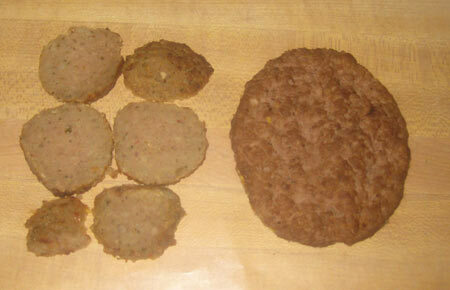 In fact, my sample patty lost 31% of this weight and ended up in my burger weighing 31.1 grams, or 1.1 ounces. And look at this! 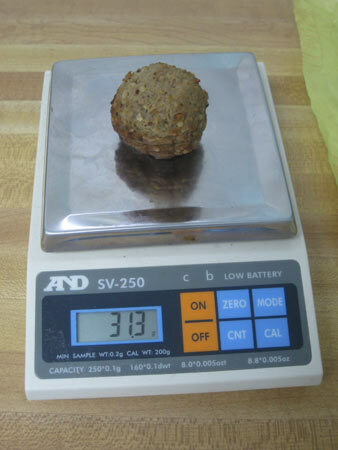 My sample meatball weighs 31.3 grams! MEATBALL WINS. This single meatball weighs more than a cheeseburger patty from McDonalds! I can't believe it! Incredible! Having spaghetti and meatballs, I had been eating the equivalent of four or five McDonald's patties!? Plus spaghetti! Incredible. The spherical shape of the meatball conceals its volume. They just don't look that big at all. No wonder they sell them in an opaque bag. I am pretty excited about this revelation, and I'm not sure why. Must be the simple joy of discovery! Now if you'll excuse me, it's time for me to make a meatball cheeseburger.